Question: Do you think that we can retain our blind spots and still attain spiritual enlightenment? The group has made some good observations about the blind spot. There are lots of correspondences possible and we, as a group, have explored the idea from several angles. Here’s an interesting idea for you. Remember I said that the blind spot must be revealed from without rather than within? Now imagine God as one life in the beginning. Now imagine that It comes to a realization that something is missing in It’s wholeness. Now imagine that God reflects Itself to infinity and by reflecting from the reflection the blind spot of even God is revealed. Creation thus illuminates a missing void in the life of the One God. As reflections of God we must also find and bring light to our blind spots. This is often hard on the old ego and there is a natural resistance for many to even acknowledge that a specific blind spot exists. True enlightenment does come as light is thrown on the dark areas. As with my singing voice I was reluctant to admit that much improvement was needed, but when the light was thrown on the truth of the matter I was forced to face it or live in a fantasy world. There may be blind spots in the formless worlds, but it does us little good to speculate on them at this stage of evolution. But in addition to the physical blind spot it is very beneficial for us to contemplate areas where they may exist within our seeing on the emotional, mental and personality levels. Earlier we talked about the principle of freedom as a key that must be understood before we can make an accurate decision for the path of light. I do not want to offend anyone by suggesting that perhaps most of us have not yet reached this point, but, on the other hand, I would be negligent in my duty, if I knew points of preparation for the great Decision and failed to present them to you. It may be of interest to note that even if the average seeker decided he wanted to take the dark path that he would be far from acceptance into the Dark Brotherhood. If a such a person were to pursue the Left Hand Path it would take around seven lifetimes of selfishness before he would be considered a reliable disciple of Self. The Brotherhood of Light is not the only one who wants reliable disciples. The Dark Brothers have standards of their own and have little use for zealous servants with little understanding of their goals. The Dark Ones do seek to manipulate the masses through illusion and astral control and some crazy guy with a goal to become a demon is of little use to them. Perhaps the most distinctive difference, but also a subtle one, is the Principle of Freedom. If you go ask a hundred people on the street if they believe in maximum freedom for themselves and others you would probably get a hundred people saying yes. On the other hand, if you were able to examine their belief systems and how they play out in their voting and actions we would find that in many cases 99 out of the 100 support unnecessary restrictions of freedom. The problem arises where programs arise that restrict freedoms in areas out of a person’s concern. If a person does not drink alcohol he is usually not bothered about restrictions on the freedom to drink. If a person is a vegetarian he is usually not bothered about restrictions on eating meat. If he does not go white water rafting then he is not bothered about restrictions on this type of recreation. If he does not take natural vitamins then he is not bothered about restrictions on their sale. There are exceptions, but the problem is that the majority are selfish enough to only be concerned about the restriction of freedom in areas that directly effect themselves. The trouble is that if we do not stand up for freedom for all, even those we disagree with, then the time will come that no one will stand up for us when our own freedoms are taken away. The reason I listed earlier five different areas where there is general disagreement about the use of freedom was not to create arguments, but to illustrate that the understanding of freedom, even in a much above average group like this, is not a cut and dried thing. Only through touching the Spirit of God through the soul can two become one in the understanding of freedom. In considering the true application of freedom one must balance his thoughts through a triangle of principles. (3) The Principle of Peace. Let us now pick a deed that we know is in error. Let us say a burglar breaks into your place and steals your valuables. How has this person violated these three principles? Now let us pick a person who we generally believe was in the right – Jesus. Why was he accused of violating these principles? Were His accusers correct? The principle of freedom is most difficult for average humanity to see clearly. One of the problems is that almost everyone thinks they understand it, but few do. This is illustrated by the wide variety of opinions people have on the five points I mentioned earlier. The wise person will filter ideas through the three principles of freedom-harmlessness and peace and relate them to each other to decide if the actions to be taken will create more harm than good. Some things take great reflection to come to the most harmless answer. With the abortion war, for example, there seems to be no good answer as it appears that suffering will occur no matter which side wins. If a burglar breaks into your home you loose several freedoms. You may loose your freedom to feel secure. If he steals your TV set you will lose your freedom to watch TV until you get a new one. If he steals your stereo you will loose your freedom to relax to your favorite music. He has caused you harm, because you suffer loss. You now may have to work extra hours to replace the stolen items. Then if they have sentimental value they may be irreplaceable. Before the burglar came you felt secure in your home and rarely gave a second thought to feeling insecure, but now your peace is destroyed. You sleep more lightly and every creak and noise you hear at night makes you jump. You are on edge now and don’t seem to have the peace you had before. When we look at the results of the burglary and see the disturbance of these three principles then it becomes obvious that we should do everything in our power to take away the freedom of others to burglarize homes. By taking away some of the freedoms of the thief to burglarize we increase the power of the majority to utilize the three principles. So it would seem as if the judgment here is quite cut and dried right? If we consider the three principles it should be easy to tell who is breaking the universal law. Such was the case of those who hated Jesus. The Master taught: “Ye shall know the truth and the truth shall make you free.” Instead the religious leaders thought that if people accepted Jesus they would have less freedom as they would have less control over the people. They just wanted things “to be” the way they had always been. But the religious leaders thought that such teaching would harm them because the faith of the people in these new teachings would take away attention from them. These teachers may even find themselves out of a job. Is that not harm? Jesus often spoke and taught about peace. He even greeted his friends with a simple “peace be unto you.” Even so, the authorities in the land felt terror in their hearts whenever they heard His name spoken. On looking back it is easy to see the folly of people who thought they were being harmed by great leaders and innovators. We laugh at the people in the days of Columbus who were afraid to travel on the great waters for fear of falling off the edge of the world, but we do not have to look far to find people today with a corresponding mindset. Their number is legion. There are many today who seek to crucify in one way or another those who merely seek to enhance the principles of freedom, harmlessness and peace. 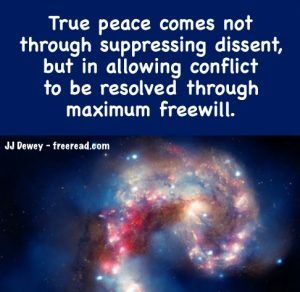 True freedom, true harmlessness and true peace is difficult to judge with the concrete mind, but when higher spiritual contact is made it is the easiest thing in the world. distort the vision of many on the three principles?